systems for Law Enforcement agencies. Our cloud-hosted calling and page out system can fill opening’s fast; with zero human interaction required. Full telecommunication (Text, Phone Call, Mobile App and Alpha Paging) is built in and rules are followed correctly each and every time an overtime position is needed. 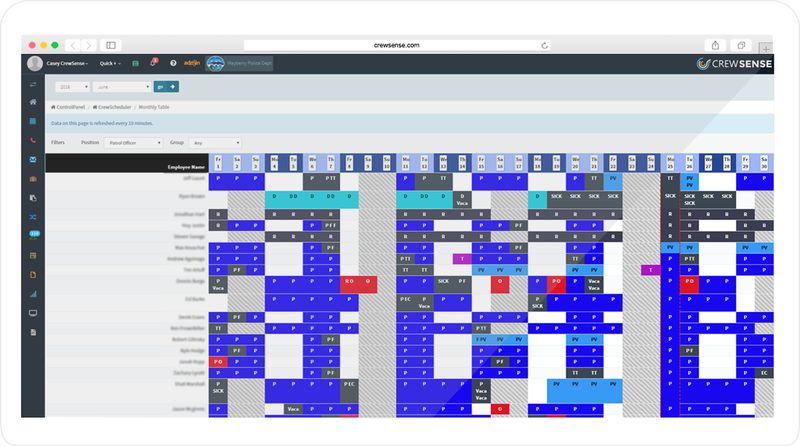 Transparent checks and balance system allows both employees and managers to view previous CallBack™ opportunities; listing important factors such as: Employees contacted, their responses, contact methods, starting ‘rank’, ending ‘rank’ and more! Detailed logs are kept for every ‘CallBack’, allowing employees to quickly see their rankings and where they ‘sit’ in the system. Easily export payroll data via multiple format options, including .csv, .xls, .pdf and payroll summary reports. Manually export data or setup 'jobs' to auto send generated reports to an FTP or DropBox location. Payroll data is also available via our full RESTful API, allowing third party payroll vendors easy access to your scheduling and time & attendance data. TargetSolutions delivers the premier online training management system for public safety agencies. The web-based software features a cutting-edge Learning Management System (LMS) with more than 250 hours of law enforcement training courses that have been approved for credit in numerous states. In addition, TargetSolutions has partnered with Calibre Press to offer law enforcement agencies with the most dynamic, informative training material on public safety's most trusted learning management system. TargetSolutions is set to release 25 all-new video-driven training courses – created in conjunction with Calibre Press – covering mission-critical categories.